A new animal disrupted the political circus in 1908 when the phonograph carried the voices of presidential candidates directly to the people. 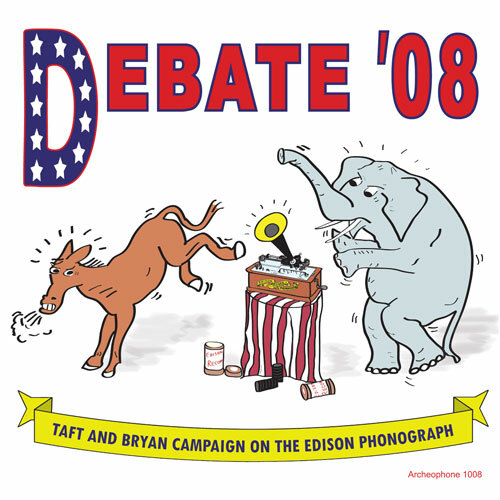 Debate ’08 marks the centennial of this historic premiere with the first reissue of all 22 Edison wax cylinders recorded by the Democratic candidate, William Jennings Bryan, and the Republican candidate, William Howard Taft. The two-minute duration of these records forced an eager Bryan and a reluctant Taft to excerpt their nuanced speeches and get to the point. Thus began the 20th century’s march to the sound bite . . . and the redefinition of political communications for all time. Debate ’08 publishes new research by Patrick Feaster, the Grammy-nominated writer for his work on Actionable Offenses and leading expert in the history of the phonograph. He traces the earliest attempts to use the phonograph in political campaigns and discusses the politicians’ objections and technological limitations that prevented widescale adoption of the medium prior to 1908. Many regarded campaigning as undignified, and shouting into the recording horn as crass. William Jennings Bryan did much to change perceptions of both, and by the campaign of 1908, with Edison having perfected mass-production and national distribution, the time was ripe. Before he ever made records, William Jennings Bryan was called “the human talking machine” by his detractors, who said he liked “to listen to himself talk over and over again.” Already the Democratic nominee in two failed presidential bids (against McKinley in 1896 and 1900), Bryan was not yet his party’s choice for president when he made his ten cylinder recordings for Edison in May 1908. He adapted two of his most popular talks, “Immortality” and “An Ideal Republic,” from extant speeches, but the other texts were developed exclusively for the two-minute wax medium. Edison’s engineer, who traveled to Bryan’s home in Lincoln, Nebraska to make the records, remarked on how well prepared and practiced Bryan was for the work. In July, when he emerged from the Democratic Convention in Denver as the standard-bearer a third time, Bryan’s ten recordings were already on sale. William Howard Taft, Secretary of War under President Theodore Roosevelt, was hand-chosen by the latter to be his successor, and the June 1908 delegates to the Republican Convention in Cincinnati agreed. Bryan’s popular “whistle-stop” style of campaigning forced Taft unwillingly into boarding the trains and pressing the flesh with voters throughout the country. Similarly, Taft was reluctantly wooed by Edison into making records so that Bryan would not have an advantage. Edison engineer Walter Miller traveled to Hot Springs, Virginia in August 1908 to make the cylinders. Unprepared for the art of recording, Taft had to retreat and edit his scripts further when he found they were too long for the two-minute medium. After a slow start, Taft warmed up to the craft and kept delivering more speeches, one after another, until he had produced twelve usable records to Bryan’s ten–his defense of “Roosevelt Policies” and “Function of Next Administration” representing the extras. When all 22 selections hit the market in the weeks before the November election, enterprising owners of phonograph parlors and amusement arcades got the idea of staging a faux debate between the candidates by playing their cylinders alternately–allowing listeners to compare Taft’s and Bryan’s positions on key issues. For Debate ’08 we have staged our own debate, allowing each candidate to speak on foreign policy, business regulation, interstate commerce, labor relations, banking reform, progressive reforms, and his personal philosophy. Our wide-format, full-color 80-page booklet includes transcripts of all the speeches, marketing text from Edison’s house organ, historical notes on the issues, and beautiful editorial illustrations. Finding a complete set of the Taft and Bryan cylinders on Edison is almost unheard of today. That is a big part of why Debate ’08 is so special. With all 22 cylinders collected together for the first time and in a deluxe package, this is now the CD of record on these Edison recordings. They are brought to you with the same critical attention and careful sonic restoration as the celebrated Actionable Offenses: Indecent Phonograph Recordings from the 1890s by the same Grammy-nominated production team: David Giovannoni, Meagan Hennessey, and Richard Martin. Get to know the candidates and their positions on the issues. Get Debate ’08 today!